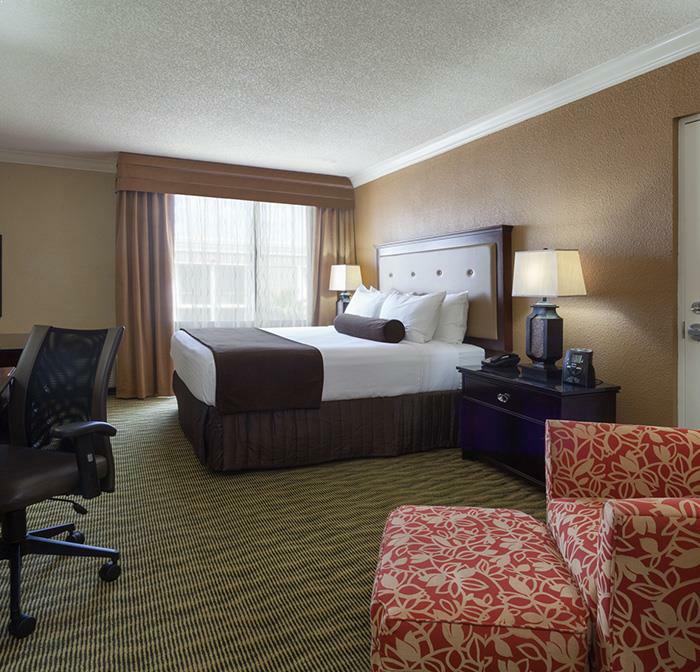 Stay recharged and ready for business atCrownePlaza Jacksonville Airport hotel, where you can work, rest and restore. Designed for today's modern business traveler, our 317guestrooms and suites are outfitted withpillow-topbeds, triple sheeting, and soft pillows and duvets that wrap you in comfort. Business travelers work smarter with a large work desk and Herman Miller chairs, Free Wi-Fi, and remote printing. Prepare for the day ahead by getting a great night's sleep with our Sleep Advantage program, with premium bedding, aromatherapy kits with resting cream, soothing body balm, and lavender spray, as well as guaranteed wake-up calls. Unplug everything, hit the sheets and drift away. 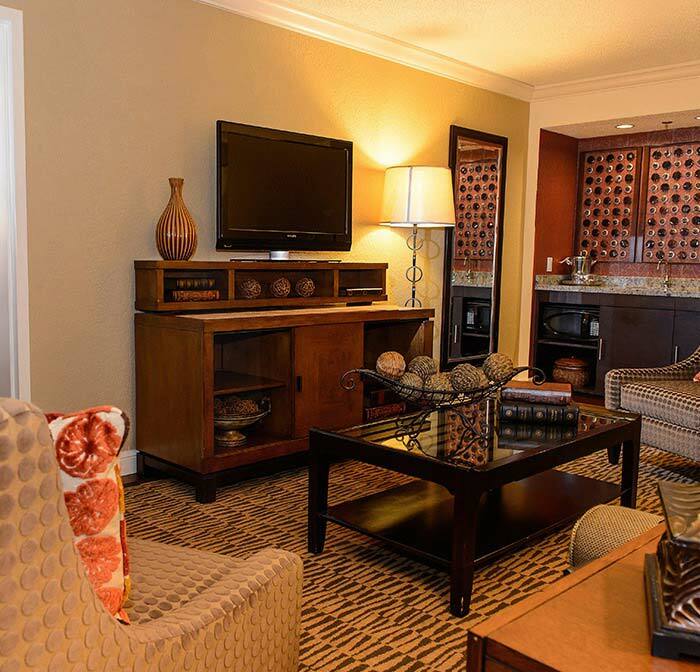 Dedicated Quiet Zones and Executive Floors welcome business travelers looking for peace and room to relax. Executive Floor rooms offers private access to the Executive Lounge, with complimentary breakfast, drinks and snacks throughout the day. Crowne Plaza has designed 12 ADA-compliant guest rooms to ensure safety and convenience for all our guests. Enjoy larger bathrooms with safety features like grab bars and oversized, roll-in showers, lowered light switches throughout the guest room and specially-equipped telephones and televisions that address any additional visual or hearing needs. Yes, all rooms have a refrigerator. If you’d like to add a microwave for additional comfort at Crowne Plaza Jacksonville Airport, they are available to rent for $10 each for the duration of your stay based on availability. 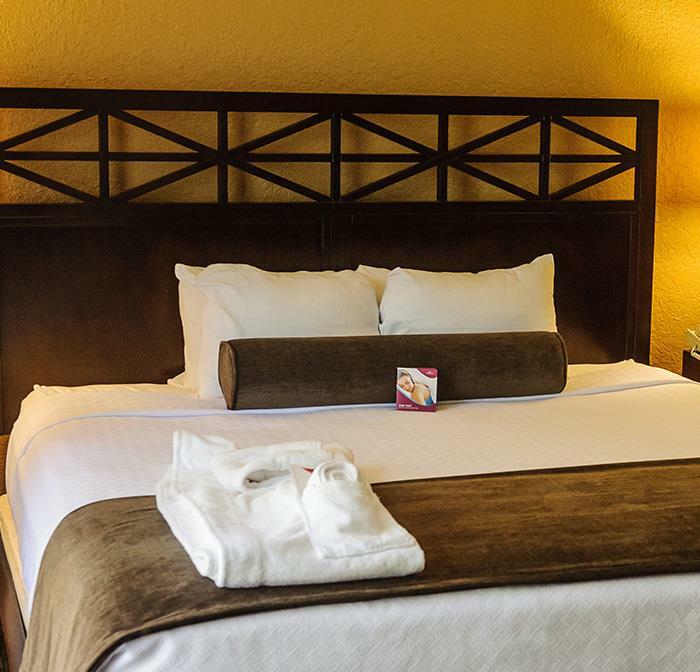 Each of our rooms also include Keurig single-cup coffee makers, spacious work areas with ergonomic chairs, and room service. Our suites also offer wet bars so you can store snacks or mix up a cocktail. Yes, Crowne Plaza Jacksonville Airport cultivates a pet-friendly attitude that welcomes all our guests along with their favorite family pet. Treat your dog or cat to the same amenities you’ll enjoy for a $75 fee when you book. There is also green space and parks nearby so you can walk and exercise your dog in the warm Florida weather. Yes. 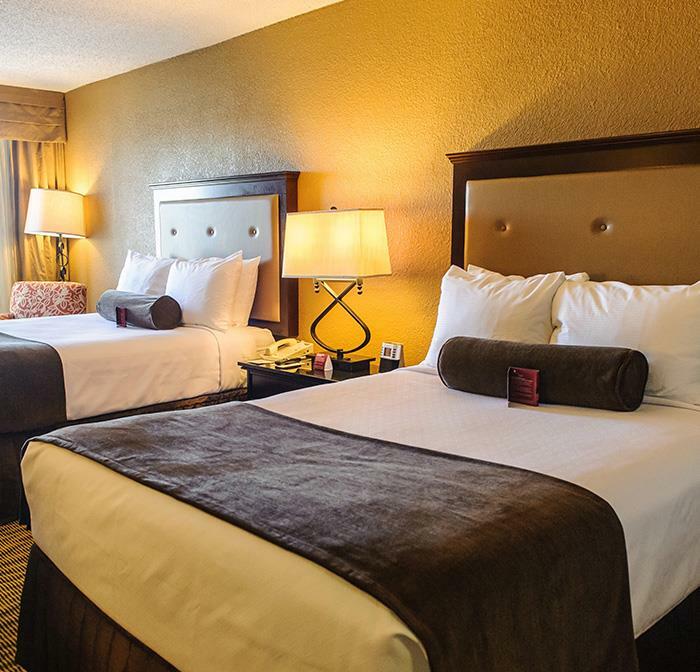 If a standard bed isn’t convenient for your family or group, Crowne Plaza Jacksonville Airport hotel offers cribs and rollaway beds to ensure every member of your group sleeps well and stays safe. Cribs and rollaway beds are available to rent for $10 each for the duration of your stay. 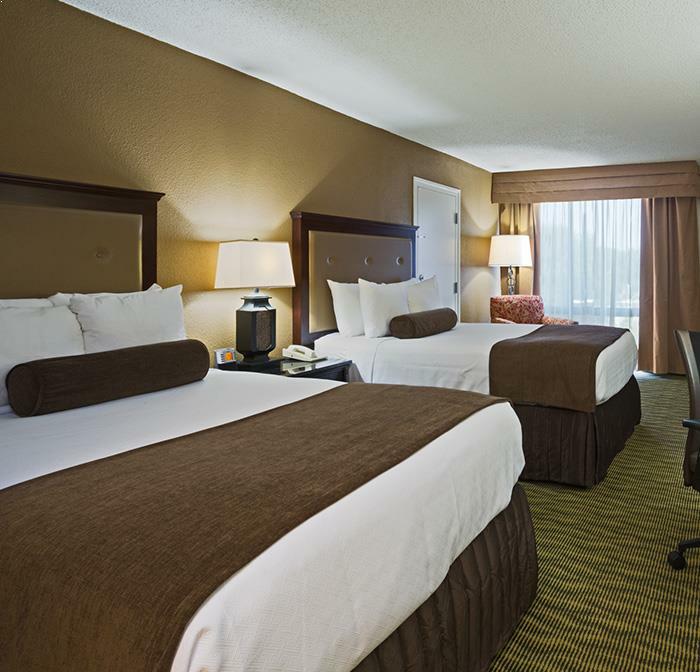 Unwind in a plush king bed and enjoy free Wi-FI, a 37" flat screen TV, Keurig single-cup coffee maker, spacious work desk with comfortable Herman Miller chair and secure wireless printing. Welcome to comfortable productivity. Spread out with the convenience of two double beds, each outfitted with our signature Sleep Advantage Program bedding, plus aromatherapy kits to ensure a good night's sleep. Free Wi-Fi and a 37" TV keep you connected. 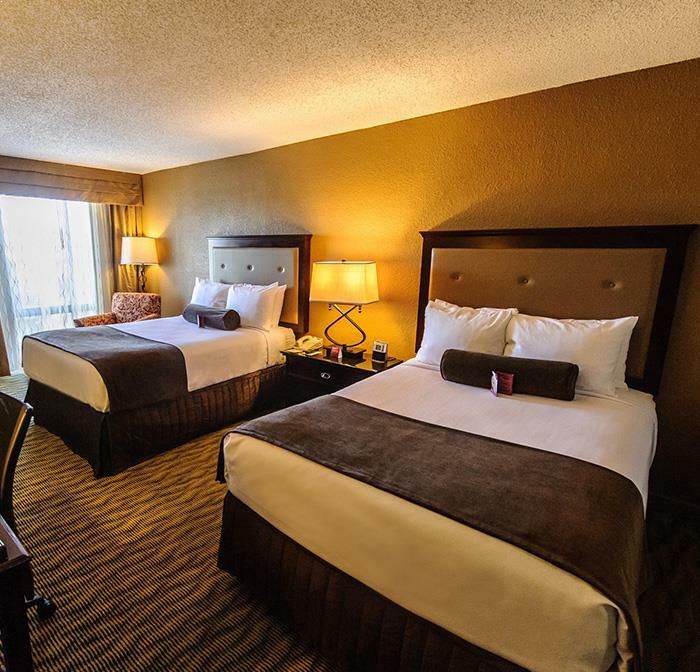 Enjoy a comfortable stay in these spacious rooms with plush beds and pillows, free Wi-Fi, a 37" flat screen TV, large work desk with ergonomic chair, Keurig coffee maker, and upgraded bath amenities. Escape to the privacy of our Executive Level floors with key card access in an adults-only atmosphere. You'll enjoy a plush king bed, free Wi-Fi, upgraded bath amenities, a spacious work desk and access to our Executive Lounge. Make the most of your time away in these large two-room suites featuring a garden soaking tub, separate shower, plush terry robes, a half-bath and a bar area with sofa and chairs. Enjoy free Wi-Fi and a dedicated work area.